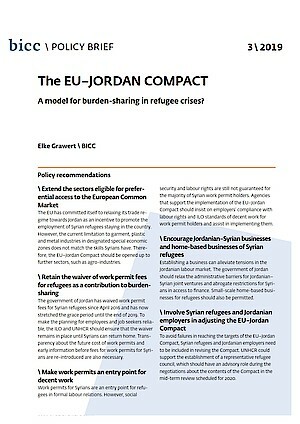 BICC Publications/The EU–Jordan Compact – A model for burden-sharing in refugee crises? You are here: Home » Publications » The EU–Jordan Compact – A model for burden-sharing in refugee crises? The EU–Jordan Compact – A model for burden-sharing in refugee crises? The EU-Jordan Compact links support for the government of Jordan as the host country of more than 670,000 registered Syrian refugees (in 2018) with economic cooperation and trade liberalisation to satisfy the interests of the government of Jordan and the European Union (EU). Established in 2016, the Compact aims to integrate Syrian refugees in the Jordanian labour market. The EU has committed itself to relaxing its trade regime towards Jordan as an incentive to promote the employment of Syrian refugees staying in the country. However, the current limitation to garment, plastic and metal industries in designated special economic zones does not match the skills Syrians have. Therefore, the EU–Jordan Compact should be opened up to further sectors, such as agro-industries. The government of Jordan has waived work permit fees for Syrian refugees since April 2016 and has now stretched the grace period until the end of 2019. To make the planning for employees and job seekers reliable, the ILO and UNHCR should ensure that the waiver remains in place until Syrians can return home. Transparency about the future cost of work permits and early information before fees for work permits for Syrians are re-introduced are also necessary. Work permits for Syrians are an entry point for refugees in formal labour relations. However, social security and labour rights are still not guaranteed for the majority of Syrian work permit holders. Agencies that support the implementation of the EU–Jordan Compact should insist on employers’ compliance with labour rights and ILO standards of decent work for work permit holders and assist in implementing them. Establishing a business can alleviate tensions in the Jordanian labour market. The government of Jordan should relax the administrative barriers for Jordanian-Syrian joint ventures and abrogate restrictions for Syrians in access to finance. Small-scale home-based businesses for refugees should also be permitted. To avoid failures in reaching the targets of the EU–Jordan Compact, Syrian refugees and Jordanian employers need to be included in revising the Compact. UNHCR could support the establishment of a representative refugee council, which should have an advisory role during the negotiations about the contents of the Compact in the mid-term review scheduled for 2020.